including the brand new PRO TREK WSD-F20 Smart Outdoor Watch and its Bluetooth-enabled EDIFICE line – as well as new projector technology and more were on display at the company’s booth in the Central Hall of the Las Vegas Convention Center from January 5-8, 2017. 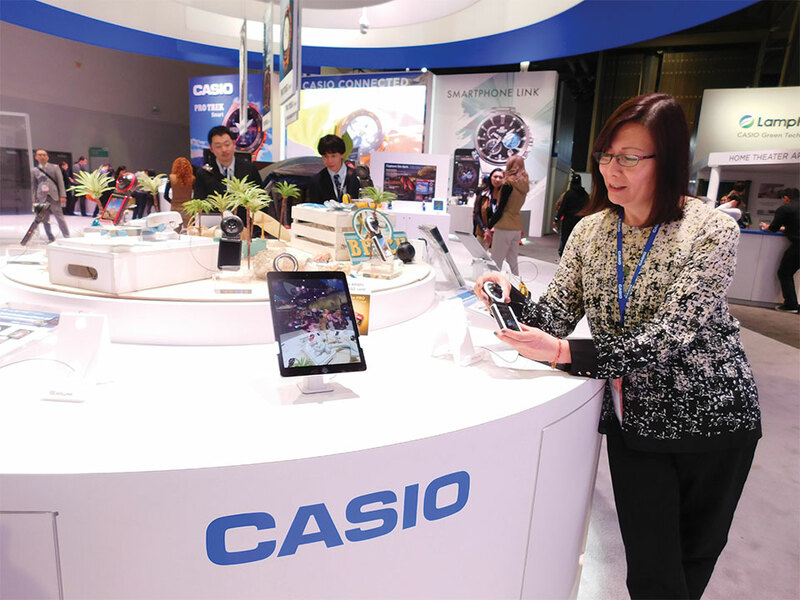 The booth’s main exhibit showcased Casio’s PRO TREK brand, which includes the just-announced WSD-F20 Smart Outdoor Watch. Officially unveiled at Casio’s CES press conference, the WSD-F20, which is scheduled to be released in early April 2017, uses Android Wear 2.0* and is equipped with low-power GPS and new full-color map functionality that can be used offline to expand the range of adventures that users can have in the outdoors. In addition to the new smart outdoor watch, Casio’s EDIFICE line of timepieces was also on display in Casio’s booth. These timepieces are stylish, yet practical solutions that are ideal for those that travel frequently– either for business or pleasure. On display were the EQB700, EQB600, EQB500 and ECB500, and while each have unique design characteristics, they all can connect to a smartphone with just a push of a button through Casio’s Mobile Link Technology. By downloading the CASIO WATCH+ app and connecting to a compatible smartphone via Bluetooth® SMART, the watches can access the correct time in their current location and for over 300 cities worldwide, even correcting for Daylight Saving Time if needed. These timepieces also feature Casio’s Tough Solar Power which eliminates the need for battery changes, as well as a phone finder function and more. The EDIFICE timepieces are available now with prices ranging from $380 – $410 depending on the model. 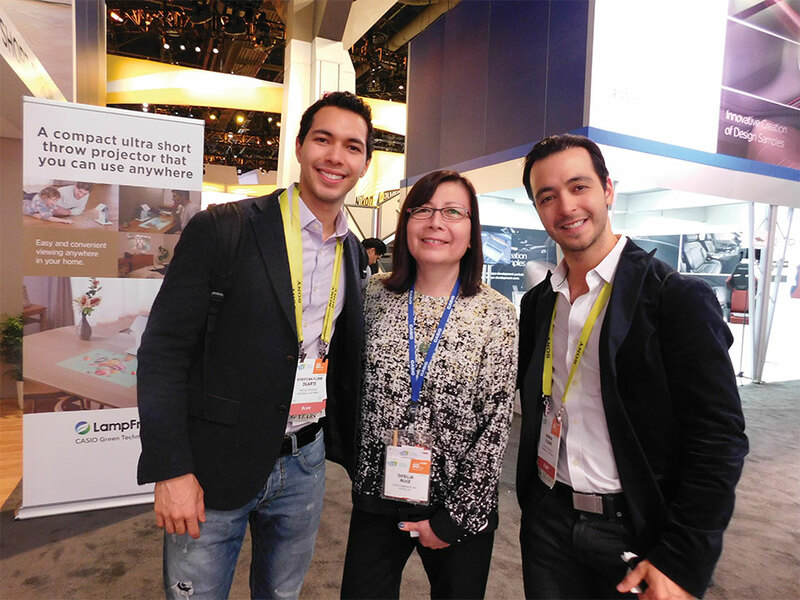 In addition to its timepieces, Casio also showcased new applications of projector technology as well as 2.5D printing in its booth at CES. Casio is known for its industry-leading LampFree® projectors for businesses and the education sector. Its projectors use both laser and LED light sources to deliver a lifespan of up to 20,000 hours, eliminating the need for lamp replacements, and offering electricity consumption that is approximately half that of a mercury lamp projector. At CES 2017, Casio showcased other applications of its projection technology including uses in the home and in instances where a screen is not available. Also on display was Casio’s 2.5D printer, which first debuted at CES 2016. The 2.5D printer is ideal for creating promotional materials, and the properties of the printer also make it possible to create samples that imitate the material qualities for car interior samples and more. Casio’s EDIFICE collection reflects a distinct sense of style by providing men with features that are ideal for professional and weekend lifestyles. The collection speaks to upwardly, mobile men whose goals lie anywhere from the boardroom to the ballpark. With a variety of aristocratic, sleek styles, Casio’s EDIFICE timepieces possess features including multi-layered dials, world time, daily alarms, and more. Made with strong, comfortable band materials of resin and stainless steel, each style exudes an attractive, sophisticated look. For additional information on Casio’s EDIFICE line of timepieces, please visit www.EDIFICE.Casio.com. Casio’s portfolio of LampFree® projectors combines a laser, a fluorescent element and an LED light to deliver a mercury-free hybrid light source that lasts up to 20,000 hours while sustaining a high brightness and keeping maintenance costs to a minimum. Casio has a full assortment of LampFree® solutions available for home, business, education and commercial applications – Core, Advanced, Slim, Pro and Short Throw.